An important aspect of contracts for difference (CFDs) is that a trader using CFDs must agree to maintain their positions at the required deposit value on an ongoing basis. Positions are updated daily so that every position is valued at the close of each business day. Profits are credited to the trading account, while any losses are deducted. Brokers constantly monitor and re-assess the value of all contracts for difference positions. The margin amount that is required to remain invested in a trade is known as maintenance margin or variation margin. This is always smaller than the initial margin and as long as the initial margin is covered, maintenance margin is not of concern. The maintenance margin is generally around 75% of the initial margin. 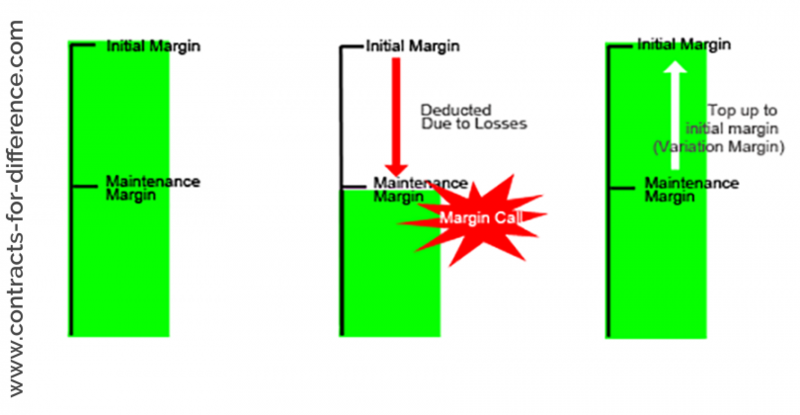 If the available balance in the margin account is reduced below a certain level due to losses, a trader is required to deposit additional funds to meet the maintenance margin requirement before a margin call is made. In addition to the Initial Margin that is required in order to open a CFD position, you may also have to pay an additional margin incurred by an adverse price movement in the market, this is referred to as Variation Margin. The Variation Margin is based on the intraday marked to market revaluation of a CFD position. What is Variation Margin? The variation margin amounts to the difference between the value of the CFD trade at the point of entry, and its value when marked to the closing price at the end of each day (this is known as marked to market). If the client’s total equity falls below the initial margin requirement lodged at the beginning of the trade, a margin call will be made. The client must now either deposit further cash into his or her account, or close out open positions in order to meet the margin requirement. The use of the variation margin is in distinct contrast to the way that stocks are regularly traded. This is because contracts for difference are in the derivative family, which means they are financial tools that have a value based or derived from an underlying asset, rather than representing ownership of the asset. CFDs are traded on margin, and they can change value to the extent that the entire margin deposited is lost. Consider, if you trade stocks, the worst that can happen is that you lose all the money that you have paid if the value falls to zero. It does not matter if you track the value as it goes down or not, you will not owe your broker any more money, and there is no reason for the broker to be concerned or even know if you have a winning trade. If instead you are trading CFDs, it is important for your broker or dealer to track the value as they could be left losing money if you could not afford to pay your losses. The variation margin is sometimes referred to as a maintenance margin. The variation margin is based on the intraday marked to market revaluation of a CFD position. For instance, if you have a long position and the price falls then you are required to pay a variation margin. The variation margin is a percentage of the total position size and the amount required will cover the adverse movement in the value of your position. On the other hand, if you have a short position and the price falls, you would receive a variation margin equal to the positive movement in the value of the position. 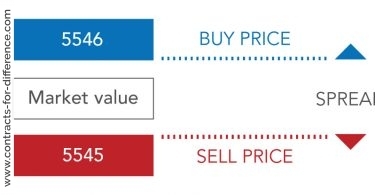 Marking to market to calculate the variation market can work in your favour, as if your position has made a profit then the amount is credited to your account each day. This money is available to open additional trades, although you should always consider your overall exposure to risk before trading to the maximum extent allowed by your broker. Again, this is very different from the situation when you are trading stocks. No matter how much stocks increase in value, you will not see any more money in your brokerage account until you decide to sell your shares. The following example illustrates maintenance margin. 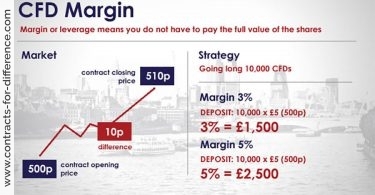 If the initial margin is £1,000, then the maintenance margin will be around £750 and the trader will need £1,000 as initial margin to trade CFDs. Suppose a trader makes a loss of £500, then the initial margin is reduced to £500. Since this is below the maintenance margin requirement of £750, the trader would need to deposit extra funds in the trading account. Therefore, in this case, the trader will need to deposit £250 to restore the initial margin automatically. If the trader does not deposit the amount required to restore the initial margin, the position would be liquidated by the broker in what is known as a margin call. The position will be exited and sold on your behalf if margin top up requirements are not met by the CFD broker. Margins are computed on an intraday basis to guarantee a sufficient level of margin cover is maintained. This means that a trader may have to pay more if the market moves against the trader. If the market moves in the trader’s favour, the margin requirement may be reduced. 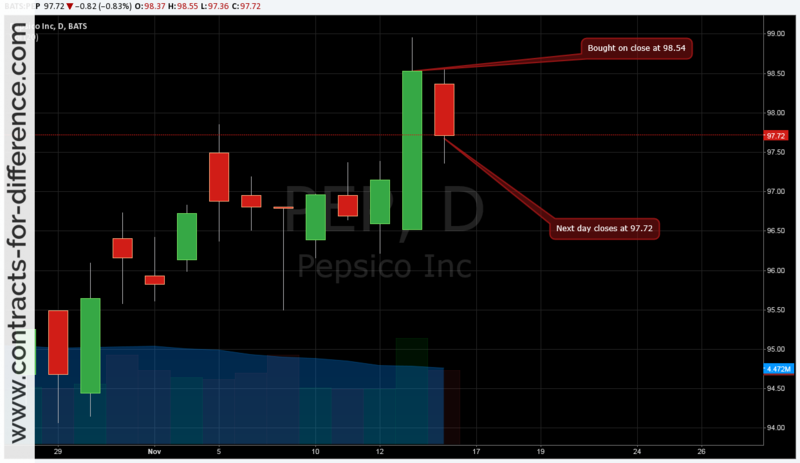 Suppose an investor is interested in Pepsico Inc. shares and wants to use CFDs to trade them. The investor expects the share price to rise. Suppose the investor buys 1,000 share CFDs in Pepsico Inc. at £98.54, which gives a position with a total value of £98,540 (1,000 x £98.54). If the initial margin is 10%, the investor would need to deposit £9,854 with the CFD broker to open the position. The next day, the share price goes down, closing at £97.72. The investor will incur a loss of (£1.82 x 1,000) £1,820. This running loss, referred to as variation margin, is subtracted from the initial margin of £9,854. This leaves a deposit of £8,034. Since the investor still holds the 1,000 share contracts at £97.72, the margin requirement will be £9772 (since 1,000[number of contracts] x 97.72[share price] x 0.1[margin]). Since there is a loss of £1,820, the initial margin has been reduced to £8,034 and £1,738 extra is needed to retain the position open. The £1,738 deposited is automatically used to restore the initial margin. If the trader did not deposit this extra amount, this is known as shortage in equity, i.e. the trading balance is below the required initial margin level. Positions can be reduced or closed if a trader has shortage in equity, but the trader cannot extend or open any positions until the equity balance is higher than the required margin deposit. Normally, the CFD provider will notify traders of margin payments. If margin payments are not made within 24 hours of being notified, the broker will make a margin call and automatically close positions. When you receive a variation margin call you must attend to it asap as otherwise your broker may take any steps necessary to stop further losses and recover his money which may lead to the position being compulsorily closed out. This does not only include selling your position for a loss, but also selling any further interests of yours that he holds as he sees fit. There is no requirement for the broker to sell your holdings in any particular order, and he may therefore take actions that you would not want, perhaps cashing in a holding that had great future prospects rather than selling the unexciting trade that you would have preferred him to do. The broker’s terms and conditions will spell this out, but as you are required to respond to the margin call, basically if you fail to do so your CFD provider has the freedom to do what he will to protect his interests. To conclude, you as the position holder are obliged to pay for any shortfall in funds if variation and initial Margins are insufficient to cover the shortfall. The recent financial crisis brought the marked to market idea into sharp focus. While mortgages were not re-valued, or marked to market, to accord with their current value, the financial house of cards was intact; but as soon as the fall in value of housing was incorporated in the valuations, it became obvious that the banks had insufficient assets to cover their liabilities, and this led to the market collapse.